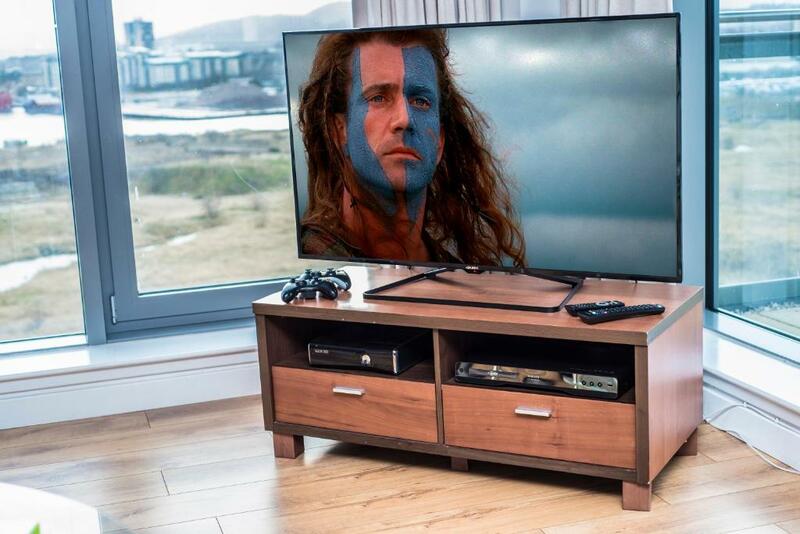 Comfortably furnished, great beds, ideally located close to supermarket, shops and restaurants in ocean terminal, 15 mins into Edinburgh on direct bus route - every 10 minutes throughout the day. Very good location, clean and quiet. The staff was nice and helpful! Asda store opened 24/7 nearby! I really liked the view and the big rooms and the light! Good parking area! 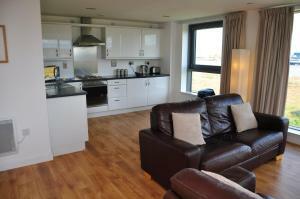 Great accommodation, spacious, clean and fantastic panoramic views. Clean, quiet. A booklet inside the apartment contains all the information needed like the taxi, bus to get into town, nearby restaurant and supermarket. Very big apartment with 2 bathrooms ideal when you travel with friends. Fully equipped kitchen if you want to cook. Local bus stop outside takes you directly to the city centre in 30 min. We choose the apartment for the location, the offer good accommodation for the price. Place was clean and and provided everything we needed. Great apartment, close to food, warm, quite comfortable and had a good view. Enjoyed staying there. Lock in a great price for Ocean Apartments - rated 8.8 by recent guests. 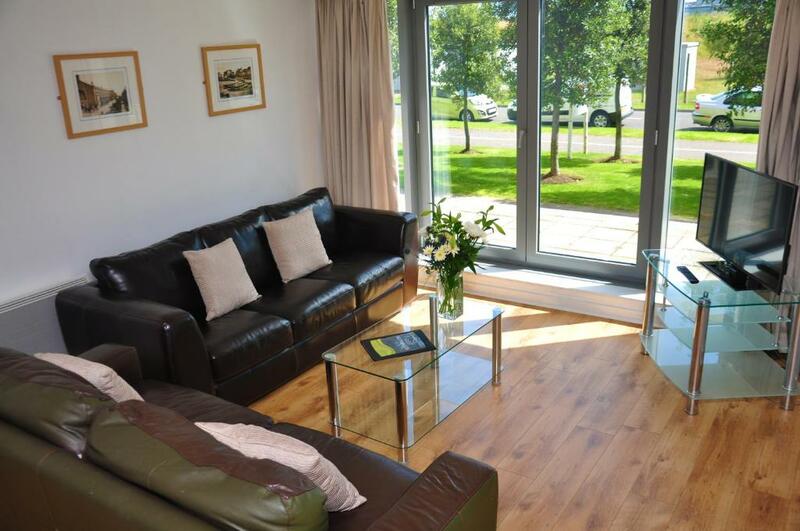 These stylish apartments are in Edinburgh, with views of the Firth of Forth and easy access by bus to Edinburgh city centre. There is free parking, Wi-Fi and DVD library. The bustling city centre with the famous Edinburgh Castle is a 15-minute drive away. 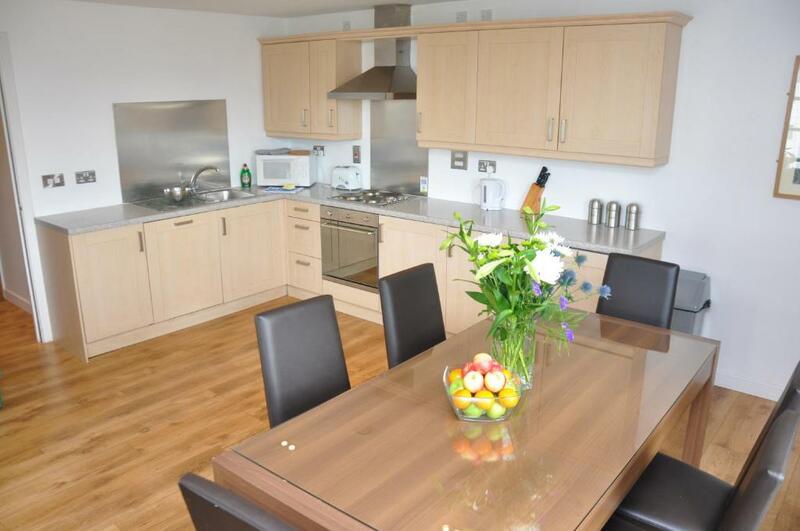 Apartments are serviced and fresh linen and towels are provided once a week. Ocean Apartments has been welcoming Booking.com guests since 9 Jun 2006. When would you like to stay at Ocean Apartments? With 2 bedrooms and 2 bathrooms. Features kitchen/dining area and spacious lounge with TV/DVD player. A DVD library is available in reception. Cots/high chairs available on request. Please request Double/Twin for each bedroom when booking. 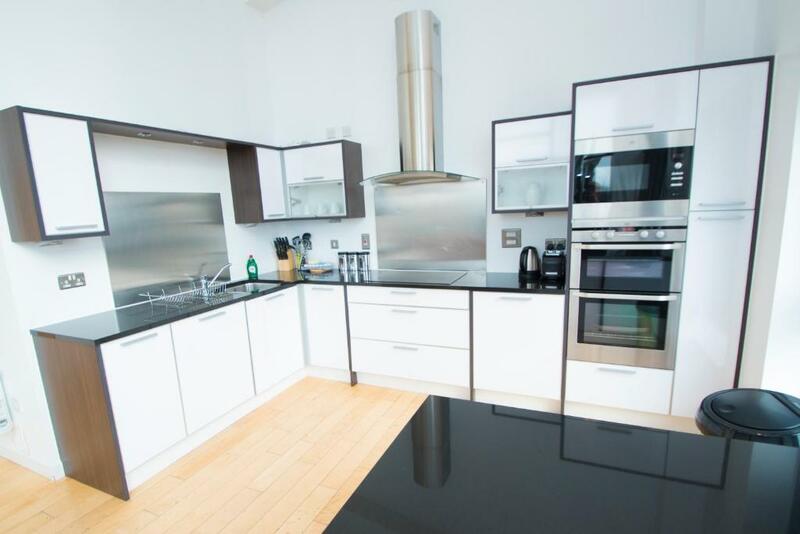 This apartment has 2 bedrooms, 1 en suite bathroom and 1 separate family bathroom. There is a well-equipped kitchen and spacious open-plan lounge with a flat-screen TV, DVD player and free WiFi. 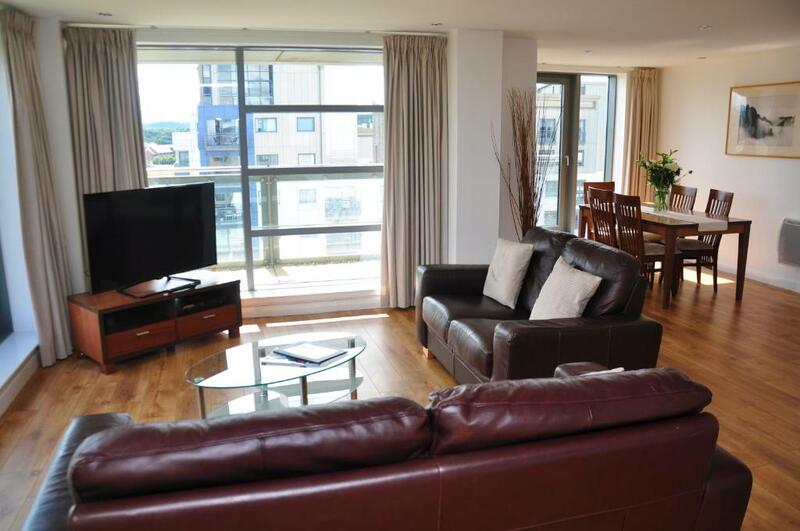 Located on the upper floors, this apartment enjoys far-reaching views over Edinburgh and the Firth of Forth. Ocean Apartments are run by a small team of staff, and we always go the extra mile to make your stay more comfortable. 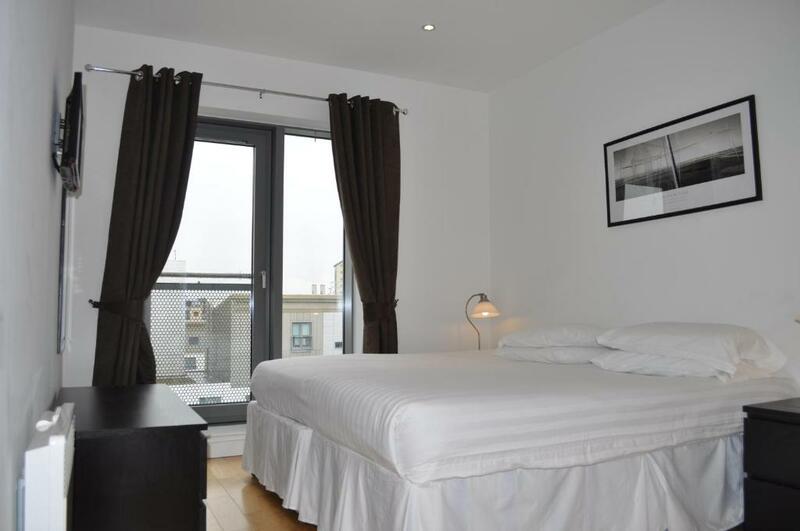 Our apartments are very popular with business travelers, families and city breaks. With FREE parking and a public bus that takes your straight into the city centre, we are the perfect choice. Our guests always compliment us on our staff. Helpfull, friendly and always going the extra mile. Ocean Apartments is located in NewHaven about 3 miles from the city centre. We are also opposite the world famous Royal Yacht Britannia, Ocean Terminal shopping and entertainment centre. A 24Hour super market is also just around the corner. House rules Ocean Apartments takes special requests - add in the next step! A damage deposit of GBP100 is required upon arrival. This deposit is fully refundable 14 days after check-out as long as there has been no damage to the property. Ocean Apartments accepts these cards and reserves the right to temporarily hold an amount prior to arrival. Please note that the reception opening hours are: Monday to Sunday from 09:00 until 17:00. For check-in and key collection within normal check in hours, please report to Ocean Apartments reception located on a ground floor of block C at 2 Western Harbour Midway, Edinburgh, EH6 6PN. Please note bed linen is not provided for cots. Guests arriving after 17:00 must contact the property at least 24 hours in advance to arrange a late check-in. Please note that if a booking is made on the day of arrival, the property will contact the guest for additional details related to their stay. A damage deposit of GBP 100 is required on arrival. This will be collected by credit card. You should be reimbursed within 14 days of check-out. Your deposit will be refunded in full via credit card, subject to an inspection of the property. Complicated in late check in. Paying a deposit. The bed matress not very good quality. You can feel the springs. If you come by car it is perfect. If you don't travel by car I would not recommend the flat. The rooms were very clean at arrival but were not cleaned for 5 days although we put out the "please clean" sign. So I recommend that you ho to the reception if you nedd the flat cleaned or garbage bins emptied. we had a hard time finding it late at night. Maybe more specific directions on how to find the key box/office. The floor wasn't very clean. We liked that it had 2 bathrooms, the beds were comfortable, the kitchen was well stocked. We had to call the "emergency" number in order to locate the key box. The person was very helpful. Close to a store and the bus stop. Far away from the city centre. Poor connection from the airport. Only one bus 10 min walk away not the best when you have luggage. The apartments asking for £100 deposit that give you back couple of days (or weeks) after check out. Not very handy if you are sort on cash.. 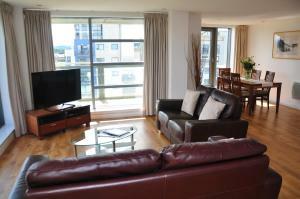 The location, views, ambience and the apartment albeit tidy has basic but tired and dated decor. The couches have lost their spring.